This was probably the biggest omission in last year's lineup of Christmas classics. Easily one of the top three most famous Christmas movies of all time (along with A Miracle on 34th Street and the grossly overrated A Christmas Story), It's A Wonderful Life is a quirky, stylish flick. Ironically, I think this movie is probably best the way it's least viewed: beginning to end. As one of the mainstays of holiday television, I suspect most people have seen this in bits and pieces. But the movie's most effective when you see how the pieces snap together, and to do that, you've actually got to sit through the whole thing. At two hours and change, you'll want to avoid the extra padding added by commercials. This movie has a reputation for being slow - I suspect most of that comes from the fact so many people grew up watching it with commercial interruption. Most of it: to be fair, there are plenty of slow parts left over. It's A Wonderful Life is fundamentally a comedy, though a restrained one. There's quite a bit of drama in it, as well, not to mention almost every other genre you can think of. It's easy to view it as a fantasy - which it is, in some respects - but one shouldn't overlook the elements of science-fiction intrinsic to its premise. In addition to influencing thousands of holiday specials and Christmas movies, aspects of the alternate universe here are clearly present in Back to the Future, Part II. It's A Wonderful Life almost feels like a precursor to The Twilight Zone. The first two thirds of the film are an admittedly slow exploration of George Bailey's character, as defined by his connections to others. While some sequences start to drag, there's a sense of weight that moves the story forward. The movie is surprisingly subtle in its work, too, layering causality beneath a more traditional narrative. If it makes one mistake, it's in laying out its cards too soon. The existence of angels could have been entirely left out until the bridge scene, and the film would be no poorer for it. I'm always surprised how long it takes to reach the alternate universe, but, once there, the film kicks into overdrive. On this viewing, I was caught by how believable George's reaction to the alternate universe seemed. He displays a manic, violent refusal to accept the truth. Since he was already in the midst of a mental breakdown, it's easy to accept this reaction. There are, of course, a handful of dated references and concepts - the horrible fate George's wife would have suffered if he'd never been born was growing up to become a single librarian - but overall this holds up. If you've got the time, there are worse ways to spend a few hours than seeing this, though I'd never recommend it over A Miracle on 34th Street. 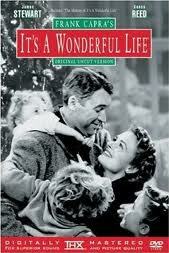 It's a Wonderful Life? Not for that guy.